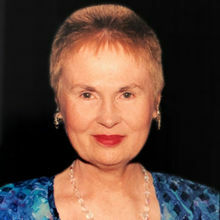 FERGAN, Joyce, E., "Joy" (nee Lapplander) February 28, 2019 Age 80. Beloved wife of Thomas for 62 cherished years. Loving mother of Linda Bowery, Thomas Fergan, and Timothy (Rachelle) Fergan. Proud grandmother of Ken, Kalvin, Sarah, Katie (Ryan), Hannah, Faith, Andrew, Daniel, Julianna, and great-grandmother of Jorah. Predeceased by her dear sister Diane (the late Walter) Higgs. Visitation Sunday 3-9pm. Funeral Monday 11am at Wujek-Calcaterra & Sons 36900 Schoenherr at Metro Parkway (16 Mile Rd). Interment Resurrection Cemetery. In lieu of flowers memorial contributions in Joy's honor would be appreciated to St. Jude Children's Research Hospital. Share memories with the family at their "On-Line Guest Book" @ WujekCalcaterra.com.